Student success is extremely important to the Nursing Department. In our curriculum and in our learning activities, we make it a priority to support students in their goal to earn the Associate of Science Degree and/or their Bachelor of Science Degree in Nursing. The faculty and staff strive to contribute to the student’s sense of satisfaction and personal growth during their educational journey. This cohesive and holistic approach to nursing education helps contribute to students’ success. 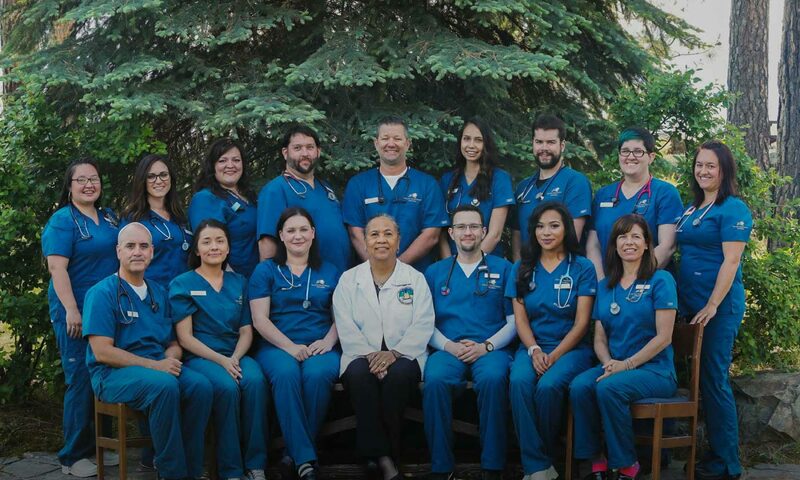 Student Nurse Organization (SNO) Student Nurse organization (SNO) is available to enrolled and prospective nursing students at Salish Kootenai College. SNO is a student club and has a faculty member advisor. SNO allows students to share and receive information about nursing school and interact with each other. SNO members interact with community members through community projects. Associate of Science in Nursing Degree (ASN) From a comprehensive nursing orientation that includes CPR certification, pathophysiology and pharmacology review, to traditional Native American games, the Salish Kootenai College nursing department offers a relationship-based approach to nursing education. Our Peer Mentoring program recognizes the importance of leadership by example and encourages peer-to-peer support during your nursing education journey. Our BSN program is designed to accommodate working nurses both from the SKC ASN program and other programs of nursing. The focus of the BSN program is leadership and management, rural and Native American community health, and the use of evidence-based practice in nursing. Our hybrid course design allows for face-to-face facilitation of learning along with a comprehensive integration of technology to further content comprehension. SKC Nursing Department offers multiple scholarship and grant opportunities to support prospective and enrolled nursing students. Please contact SKC Financial Aid Office for current list of available scholarships and grants. SKC does not discriminate on the basis of race, ethnicity, national origin, gender, age or disability in admission or access to educational programs or college activities. Because SKC is a tribal college, some academic programs may have tribal preference policies explained in their admissions materials. Inquiries concerning Title VI, IX and Section 504 may be referred to: Rachel Andrews-Gould, Title IX Coordinator, (406) 275-4985. Salish Kootenai College is accredited by the Northwest Commission on Colleges and Universities. Salish Kootenai College | PO Box 70| Pablo, MT 59855 | 406.275.4800.